When I left off last time, we had just checked into our guesthouse in Jagat and were looking forward to a solar heated shower. Getting one would turn out to be a little more difficult than you might think. The little shower room looked like the boiler room of an aircraft carrier, with a maze of pipes covering the walls and ceiling and buttons and dials of all sizes dotted throughout. One of the pipes came from the solar heater on the rooftop and the others led to several propane powered water heaters clinging to the walls of the tiny room, but they all ran into, under, over and through each other so many times, that we had no idea which was which. We had even less of an idea what any of the buttons actually did and, while we figured the dials controlled the water temperature, turning any one of them did nothing. There was clearly some secret combination. The next morning, we started out following the new road and so did a LOT of goats. Sure enough, when our host pushed a few buttons here and turned a few dials there then seemingly turned a few of the same dials again, the pipe covered walls rumbled for a few brief moments and a small trickle of lukewarm water—barely enough to be called a trickle, really and just slightly more than a series of drips—emerged from one of the shower heads. But not the nicest looking shower head affixed in the most logical location; the water came from some ancient, rusted spout that was barely poking out from among a mess of pipes in the corner. None of us had any confidence we could replicate the code to get the trickle of lukewarm water, but luckily, the couple that had checked in just after us took care of that problem. Unfortunately, they did so by using up all the slightly warm water and leaving us with showers that were just a few degrees above glacial runoff. At least I assume that’s what they did. There’s a chance our host simply forgot his own complicated warm-water-code and wasn’t ever able to replicate it again. Either way, it wasn’t the first cold shower of the trip and it definitely wasn’t going to be the last. After our showers, we sat down in the front garden for some dinner. Pretty soon most the tables were full of guests and while we were all enjoying our food, a group of small girls from the village showed up and began singing a song in celebration of Diwali. The song wasn’t all that great but the girls were really cute, so when they made the rounds with a donation plate, they cleaned up. We saw numerous thousand rupee notes on the plane (about $12). I would say they cleared close to 100 bucks. The second the girls left—in an example of some of the worst timing ever—a group of teenage boys showed up to perform the same song. People had pretty much just emptied their wallets for the little girls, but even if they hadn’t, the croaking sounds and bad attitude emanating from the gaggle of zits and peach fuzz ensured those wallets stayed buried deep down in their pockets. I don’t think the boys made more than a few cents. When we emerged from the forest, we found ourselves in the village of Chamche. The next morning we embarked on what turned out to be our first real day of trekking. We covered about half the distance of a normal person and did quite a bit of climbing. For the first time we could actually be somewhat proud of the distance we had covered during the day, although, to put things in perspective, we spent that night in Tal, which is the village the older German guy from our bus was planning on reaching the first day. We started out walking on the new road, which basically ended in Jagat at the time. The section from Jagat to Tal was currently under construction and we saw several signs warning trekkers of possible blasting. They weren’t doing any of that while we were there, but we still tried to get away from the road as much as possible. For the first part of the day, we followed a small trail up into the densely forested hillside, crossing streams on log bridges and passing several abandoned guesthouses that were slowly being taken over by the surrounding forest. After a few hours, we had to drop back down to the river for another crossing, which was just as much fun as always. At least this time, crossing the river took us away from the road and onto a narrow dirt trail clinging to the steep hillside. We started seeing more and more donkey trains and every time one came barreling toward us in a cloud of dust, we had to quickly press up against the hillside to avoid being run off the narrow path and plunged into the river far below. The whole time, we could see the new road running far above us and climbing steadily along the other side of the river. Eventually it ended when a humongous rock formation blocked its path, but looking more closely, we could make out the line where the blasting had already begun. Seeing the scarring so high above us on the massive cliff face was both impressive and a little sad. And very frightening. Frightening, because the fact that the road was so much higher than we, could only mean one thing: we would have to ascend to the same level sometime before the next town. And the next town was just around the corner. Sure enough, we could soon see the switchbacks climbing up a steep, rocky incline and disappearing into the clouds. I may have exaggerated the cloud part. Either way, time for lunch. Luckily, some clever entrepreneur had opened a tiny little restaurant just at the bottom of the ascent, thinking that people might want to get a bite to eat, or at least some tea, before tackling the climb. It was like he had read my mind. Since he was basically cooking on an open flame in a tiny shack, it took forever to get our food. Sitting there with a beautiful view of the river valley behind us and a foreboding view of the steep hill we would soon have to climb in front of us, we did not mind the delay at all. The good news was that Tal, our destination for the day, was just beyond the top of the hill. We could climb up and pretty much sit right down for dinner. I remember really hating life as we were working our way slowly upwards, but looking back now and comparing it to what was to come, I realize just how inconsequential that little climb really was. The view back down the Valley was beautiful and to be honest, before we even knew it, we were at the top, face-to-face with a large stone gate, framing the now-widened river valley and the village of Tal in the distance. 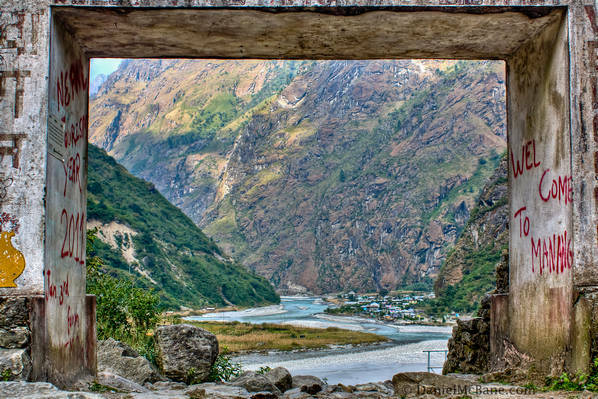 The gate serves as the entrance to the Manang district and also marks the point where the lush warm forests of Hindu Nepal end and the cold and barren landscapes of Tibetan Nepal begin. Tal ended up being one of my favorite places along the Annapurna circuit to spend the night, mainly because of our guesthouse. And that mainly because of the woman who ran it. The food she cooked was easily the best of the whole trek. We had a potato curry full of vegetables and some homemade cornbread. We immediately ordered more cornbread to take with us the next day. It was amazing. The best guesthouse in Tal, serving the best food of the whole trek. I wish I remembered the name. The guesthouse is located at the far end of town, meaning most trekkers find a place to stay long before they ever get there. That is a real shame. This woman deserves more business. We only made it to the end of the village thanks to our ongoing quest to find the most comfortable mattresses in every town, so as not to repeat some of the horribly painful nights we suffered through earlier in the trek. We passed up on numerous sheet-covered plywood beds, before finding this place, featuring actual mattresses. Once we had a taste of the food, I think we would have been happy to sleep on a bed of broken glass. Who Says Trekking in Nepal Has to Involve Lots of Walking? Bet your legs are letting you know that the hike is there. Great shots – love all the colors! Looks like a rough terrain with those steep mountains. It must have been a lot of fun. Great photos. It was very rough, which actually makes the road they are building that much more impressive. And I definitely enjoyed the trek, even though there were times when I was asking myself “Why did I do this?” Usually that was on the steep uphill sections. I definitely enjoyed it. I’m not generally a huge fan of physical exertion, but this trek was such a great experience that I’d do it again in a second.